When I first heard about marine binoculars, I wasn’t too sure how differerent they would be a normal pair of binoculars. As I started doing my research, I realized that the ocean presents some very unique challenges that the average pair of binos are not built for. The one obvious difference is the bigger risk of water damaging your binocs, but the morning fog, glaring sun in the late afternoon and the spray of saltwater makes marine binoculars a very specialized item. I haven’t even mentioned the incredible difficulty in judging distance when floating on the ocean, and the big temperature swings. These highly specialized binos could very well be alot tougher than their hunting counterparts. When searching for a good pair of marine binoculars, there are a number of factors that you must keep in mind. Before we get into these 8 characteristics of a good pair of marine binocs, let’s talk about some of the top marine binoculars brands. For nearly 70 years Steiner-Optik has been manufacturing some of the best optics on the planet. It was in 1979, that Karl Steiner created the first binocular with an integrated compass. It was called the Commander. It has been the most successful professional marine binocular ever since. If you are looking for premium 7×50 marine binoculars, Steiner is the brand you want to go with. From the value for money Steiner 7×50 Marine, to the recreational Navigator and the premium Commander series, Steiner has advanced optics to offer all anglers, boaters and sailors. Obviously, marine exploration is done in water. It is only but natural that your binoculars must be waterproof . Be careful, however, as there are different kinds available in the market. Get a pair that contains an o-ring seal and charged with dry nitrogen gas. Binoculars that have these will be free from fogging. This will also ensure that water and moisture does not get inside and damage your binoculars. As a result, your gear will be protected from corrosion as well. Aside from these, consider also buying a pair that can stay underwater for a long period of time. This is especially if you are worried about them falling off into the water. Binoculars are meant for you to be able to see clearly those things that are in a distance. Magnification is a crucial feature in a binocular as it sets the quality of your view. The larger the magnification, the better your view will be. Choose then those binoculars with a high quality magnification to provide the best sight. However, you should also keep in mind that stability affects magnification. A deck of a boat is never steady. It is then a bad idea to use high powered binoculars as it is impossible to stabilize the image. Get a set that has 7x magnification. This is common among majority of marine binoculars. This gives you a good view of your images without having stabilization problems. Are not satisfied with the power of the 7x magnification? You can also buy binoculars that have image stabilization built into them. There are many options available in the market. This means the size of the lens that are at the tip of your binoculars. The lens size determines the amount of light that can get into your binoculars. Large objective lenses allow more light to get in which will produce a brighter image. Take into consideration what time of the day you will use your binoculars. Factor in also the light in the space where you will use them. Larger lenses, however, would mean bigger and heavier binoculars. Although this may not be a problem to some as they are used on a boat, there are still plenty of sizes you can choose from. Most marine binoculars have objective lenses ranging from 30mm to 50mm. Field of View is the horizontal width of what you can see when looking through your binoculars. This is not a critical factor in marine binoculars. Yet, it is still something that should be taken into consideration. A wide field of view will allow you to easily see a variety of subjects in your view. But, the extent of your field of view will also affect your magnification. A wider field of view will mean a lower magnification. Hence, you should get binoculars with the right field of view and magnification. 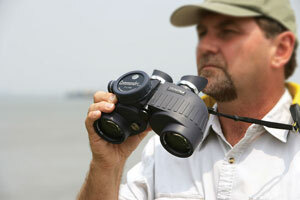 Opt for 7×50 marine binoculars. They provide a perfect balance between magnification, lens size, and field of view. The size and weight of your marine binoculars really depends on you. Since you are on a boat, bringing small or big ones would not be a problem as you can just put them aside on deck. 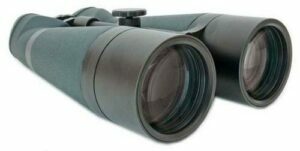 There are many marine binoculars available in the market that features an integrated compass. These compasses also come in different kinds. There are those digital ones or those that light up during the night. Get one that will fit your needs. There are unexpected incidents that could possibly happen during your marine exploration. Things can accidentally plummet and dive into the water. It is best that you attach a floating strap to your binoculars if you are worried of them falling into the water. This will ensure that they stay on top of the water long enough for you to fish them out.